A rich red tomato based curry paste flavoured with mace, black cardamom and fennel. 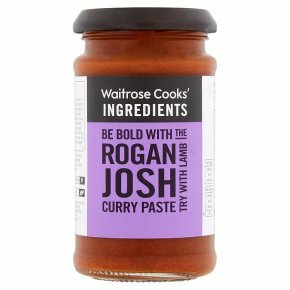 Be bold with the Rogan Josh Curry Paste. Try with Lamb. INGREDIENTS: water, onion purée, onions, concentrated tomato purée (7%), garlic purée, rapeseed oil, ginger purée, cumin powder, paprika, salt, chilli powder, concentrated onion juice, maize starch, acidity regulators acetic acid and citric acid, cassia, cumin seeds, fennel powder, yeast extract, onion extract, cardamom powder, sugar, toasted onion powder, coriander, clove powder, allspice, ginger, nutmeg, dill, black pepper, mace, aniseed.